Purchased securities are not currently tradeable. Expect to hold your investment until the company lists on a national exchange or is acquired. Cytonics is offering securities under both Regulation D and Regulation CF through SI Securities, LLC ("SI Securities"). SI Securities is an affiliate of SeedInvest Technology, LLC, a registered broker-dealer, and member FINRA/SIPC. SI Securities will receive cash compensation equal to 7.50% of the value of the securities sold and equity compensation equal to 5.00% of the number of securities sold. Investments made under both Regulation D and Regulation CF involve a high degree of risk and those investors who cannot afford to lose their entire investment should not invest. Furthermore, the contents of the Highlights, Term Sheet sections have been prepared by SI Securities and shall be deemed broker-dealer communications subject to FINRA Rule 2210 (the “Excluded Sections”). With the exception of the Excluded Sections noted above, this profile contains offering materials prepared solely by Cytonics without the assistance of SI Securities, and not subject to FINRA Rule 2210 (the “Issuer Profile”). The Issuer Profile may contain forward-looking statements and information relating to, among other things, the company, its business plan and strategy, and its industry. Investors should review the risks and disclosures in the offering's draft. The contents of this profile are meant to be a summary of the information found in the company’s Form C. Before making an investment decision, investors should review the company’s Form C for a complete description of its business and offering information, a copy of which may be found both here and below. Cytonics is a leader in the field of regenerative medicine and is positioned to disrupt the space with their innovative biologic therapies for musculoskeletal diseases. Osteoarthritis (OA) is a crippling disease that is caused by the breakdown of cartilage within joints. While the exact cause of OA remains unknown, post-traumatic injuries (e.g., ACL tear) and age-related wear-and-tear of the joints significantly increase the incidence of the disease. Over 27 million people are treated for arthritis-related pain in the United States alone, placing a $180B burden on our healthcare system and economy. Missed work and excessive medical expenditure all result from the lack of an effective treatment. We believe the discovery of a safe, effective therapy for OA would have an enormous impact on the well-being of our nation’s population and significantly reduce the burden placed on our economy. Cytonics' solution to the OA problem is to deliver high concentrations of Alpha-2-Macroglobulin (A2M), a blood serum protein that has been shown to protect cartilage, into the joint space to slow and eventually halt the progression of arthritis. We leveraged our understanding of the molecular forces that cause osteoarthritis to develop the "Autologous Platelet Integrated Concentration" (APIC) system, a device which concentrates A2M from patients' own blood to treat damaged joints. The APIC technology has treated over 6,000 patients nationwide, and has been shown to slow cartilage degradation, alleviate pain, and eventually halt the progression of OA. Our current focus is on the development of CYT-108, a biologic therapy that was modeled after the naturally occurring A2M molecule found within blood. CYT-108 is a synthetic version of the A2M molecule that we hypothesize is more effective and 2-4x more potent than naturally occurring A2M. If approved by the FDA, CYT-108 will be the only therapy we are aware of that addresses the root causes of osteoarthritis and has the potential to cure this disease. Alpha-2-Macroglobulin (A2M) is a naturally occurring blood serum protein involved in blood clot formation. A2M is also a well characterized, broad-spectrum protease inhibitor that has demonstrated potent inhibitory activity against the proteases that destroy cartilage in osteoarthritis (OA). Unfortunately, the levels of naturally occurring A2M may be too low to lend therapeutic benefit to damaged joints. Delivering high concentrations of A2M directly into afflicted joints, however, has been shown to inhibit these cartilage-destroying proteases, slowing and potentially halting the progression of OA. Our flagship product, the Fibronectin-Aggrecan Complex Test (FACT), detects the presence of the Fibronectin-Aggrecan Complex (FAC) in samples of patients' joint fluid. A positive readout indicates that the patient's cartilage is damaged due to overactive proteases, and that the patient would benefit from our APIC treatment. We licensed the FACT to Synthes (acquired by Johnson & Johnson) in 2010 for $5M. The FACT is currently sold by our national distributor directly to orthopedic physicians. The APIC system isolates A2M found naturally in the bloodstream, producing a concentrated solution that is then injected into the damaged joint. This is achieved by centrifuging patient's blood, then filtering out proteins that could cause damage to the joint while retaining the therapeutic A2M. The clinical success of our APIC therapy is evident--over 6,000 patients have been treated to-date. We licensed our technology to a national distributor for $850,000 upfront and 10% royalties on net sales. To-date, our distributor has sold over 6,000 kits directly to physicians. Our distributor anticipates a dramatic growth in sales in 2019 as the company was recently acquired by a much larger international distributor, effectively doubling the sales force and giving access to international markets. "I have been using Cytonics’ Alpha-2-Macroglobulin kits to treat various joint pains, mostly in the knee. This is part of my regenerative medicine practice. I’ve seen remarkable results such that I have suggested that my wife and my son undergo treatments. The treatments were remarkably successful in both of them. I am very pleased and I’m looking forward to having this product [CYT-108] available more easily off-the-shelf and approved by insurance. I expect a huge demand for it." “I [have] suffered [from] prolonged pain from a partial tear in my right Achilles tendon... After almost eight months of therapy and various treatments, R. Grossman, MD told me about Cytonics and the available A2M treatment. I received my first injection in April of 2018 and within weeks the large nodule in my Achilles had shrunk significantly... The A2M therapy has given me my life back." *The above individuals were not compensated for their testimonials. In addition, their testimonials should not be construed as and/or considered investment advice. We leveraged our understanding of protein engineering to create a synthetic version of the naturally occurring A2M protein, dubbed "CYT-108." CYT-108 was engineered with a special "bait region" located in the center of the protein, responsible for trapping the destructive proteases that are upregulated in osteoarthritis. This engineered bait region makes CYT-108 more potent than the naturally occurring (wild-type) A2M. We have contracted Goodwin Biotechnology, a contract research organization, to purify industrial-scale quantities of CYT-108 for pre-clinical experiments and FDA clinical trials. We expect to begin pilot pre-clinical trials in late-2019. Gaetano Scuderi, MD, a fellowship-trained spine surgeon and former Stanford professor, began his quest to find the source of joint pain by assuming that there must be some compound that forms when cartilage begins to degrade due to arthritis. If such a biomarker could be located, then it could become an objective test for the presence of arthritis in joints, and hint at the cause of the cartilage damage. Dr. Scuderi examined the joint fluid from colleagues, employees, and even family members for biomarkers. Dr. Scuderi’s first published paper (2006) attracted the attention of the Stanford Medical community, which became instrumental in conducting research and raising funds for the company. In 2006, Dr. Scuderi made a key hire, Lewis Hanna, PhD, an experienced R&D leader in biologic therapeutics. This research team created a specialty cartilage research lab focused on developing biologic solutions for osteoarthritis, giving birth to the APIC system and CYT-108. In 2018, Dr. Scuderi hired Joey Bose as President to oversee the drug development program. With the expert guidance of business, scientific, and regulatory consultants, Dr. Scuderi was able to form a critical mass of scientific and business expertise within the company. Gaetano Scuderi, MD is the Founder and Chairman of the Board of Cytonics Corporation. Dr. Scuderi is a fellowship-trained (UCSD, San Diego, CA) spine surgeon who has practiced medicine since 1993. He was also appointed to Clinical Assistant Professor in the Department of Orthopedic Surgery of Stanford University. He graduated medical school from State University of New York (Buffalo, NY) and completed his Residency at University of Miami School of Medicine (Miami, FL). Dr. Scuderi has published over 45 scientific articles and has lectured world-wide. Dr. Scuderi currently practices orthopedic surgery in Jupiter, FL. 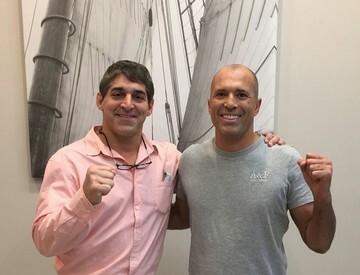 In addition to his clinical practice and his role with Cytonics, Dr. Scuderi is a 4th degree black-belt in Jiu Jitsu and the founder/principle instructor of Scuderi Self Defense (Jupiter, FL). Dr. Scuderi's love for this martial art is only surpassed by his passion for helping the sick and elderly reclaim their mobility and quality of life. Why did the company change names in 2007? We wanted a name that was more reflective of the focus of our technology: Cyt + tonic = cell + elixir. This name is more reflective of the discovery of the cytokines that damage cartilage in OA and our treatment which attenuates their deleterious activity. Please explain Dr. Scuderi’s day-to-day role at Cytonics. Does Dr. Scuderi currently have any engagements outside of his role at Cytonics? Dr. Scuderi is involved in the high-level decision making of the company. He has been instrumental in both the R&D and financing aspects of the company, and maintains close relationships with many doctors and scientists in the regenerative medicine space. Dr. Scuderi is a practicing orthopedic surgeon, who also teaches Jiu Jitsu (owner of Scuderi Self Defense; Jupiter, FL) and serves as an expert witness for medical malpractice cases. How is Raymond Johnson currently employed? Raymond Johnson is an external advisor to the company and is employed on a consulting basis. He contributes 5 to 15 hours per month in his performance of these duties and is compensated at the rate of $250 per hour for his services. He does not have an employment or consulting contract with the company. Mr. Johnson advises the company on matters of fund raising, licensing agreements, personnel, investor relations, budgeting, and corporate finance. Why is this executive team the right team to be executing on Cytonics’ strategy? Are there any gaps in the team? If so, what and how does the company plan to fill these? Cytonics has a qualified team of MDs, PhDs, and MBAs who are highly experienced in all aspects of biotechnology research and development. Our founder and chairman, Dr. Gaetano Scuderi, has been recognized as one of the top spine surgeons in the country and has been a professor and researcher at Stanford University. He leads our team of other top orthopedic surgeons who have contributed their clinical knowledge and drug trial experience to Cytonics from the company’s onset. Dr. Lewis Hanna, our de facto Chief Scientific Officer, has over 40 years’ experience leading biotech research teams for Fortune 500 pharmaceutical companies. He leads our team of PhD researchers in the development of our recombinant protein therapeutics. Our president, Mr. Joey Bose, has significant experience in protein engineering and in healthcare investment banking. His cross-over skillset enables him to effectively manage the development of the company and its therapeutic assets. The company will continue to hire research, clinical trial, and management staff on a direct and contract basis as required. Please identify the major risks to Cytonics’ R&D roadmap through to commercialization of CYT-108. The major impediment to our proposed R&D roadmap is demonstrating the clinical success of CYT-108 in the stages of FDA clinical trials. There are many reasons why a drug that has demonstrated efficacy may fail, including statistical reasons an insufficiently “powered” test (“Power” is the probability of correctly rejecting the null hypothesis in favor of the alternative hypothesis). We can mitigate this risk by estimating the therapeutic effect we expect in the clinical trials, based upon previous experiments, and ensuring that the study has enough participants to be appropriately powered. Other reasons that the drug might fail in clinical trials include: (1) Poor study design, (2) Poor purification of the drug product, and (3) Adverse events. We will mitigate these risks by (a) Working closely with the FDA to ensure that our proposed study protocols are comprehensive, (b) rigorously testing our purified CYT-108 in vitro, and (c) Conducting a Pilot Study ahead of the Pre-Clinical study to monitor the potential adverse effects of CYT-108 in large animals, then modifying the model, dose, and dosing schedule accordingly. On the commercial side, the major impediment to getting CYT-108 to market comes from identifying a strategic partner or acquirer to bring the drug to market. Given the massive unmet need for an effective treatment for OA, our relationship with J&J, the clinical success of our APIC therapies, and the general excitement in the regenerative medicine community, we believe that we have a high probability of partnering with a large institution to bring CYT-108 to market (or selling the developed asset to a large pharmaceutical company). All non-Major Purchasers will be subject to an Investment Proxy Agreement (“IPA”). The IPA will authorize an investment Manager to act as representative for each non-Major Purchaser and take certain actions for their benefit and on their behalf. Please see a copy of the IPA included with Company's offering materials for additional details. Investors who invest $50,000 or less will have their securities held in trust with a Custodian that will serve as a single shareholder of record. These investors will be subject to the Custodian’s Account Agreement, including the electronic delivery of all required information. While Cytonics has set an overall target minimum of US $250,000 for the round, Cytonics must raise at least US $25,000 of that amount through the Regulation CF portion of their raise before being able to conduct a close on any investments below $20,000. For further information please refer to Cytonics's Form C.
The graph below illustrates the valuation cap or the pre-money valuation of Cytonics's prior rounds by year. Cytonics Corporation (the “Company”) is a research and development company that develops therapies and diagnostics for back and joint pain, which it then licenses to unrelated third parties. The Company was incorporated in the State of Florida under the name Gamma Spine, Inc. on July 19, 2006 and was renamed Cytonics Corporation on April 17, 2007. As shown in the accompanying financial statements, attached as Exhibit B, the Company has sustained a net loss of approximately $0.6 million for the year ended December 31, 2018 and has an accumulated deficit at December 31, 2018 of approximately $15.4 million. To date, the Company has funded its research and development and operating activities through sales of debt and equity securities, grant funding and licenses of its products. The Company intends to continue to seek funding through investments by strategic partners and from private and public sales of securities until such time that the Company generates sufficient cash flow to sustain its operations. The proceeds from the Offering are essential to our operations. We plan to use the proceeds as set forth above under "Use of Proceeds", which is an indispensable element of our business strategy. The Offering proceeds will have a beneficial effect on our liquidity, as we had approximately $772,330 in cash on hand as of December 31, 2018 which will be augmented by the Offering proceeds and used to execute our business strategy. The US-market for an effective treatment for osteoarthritis (OA) was estimated by examining Hyaluronic Acid (HA) sales in years past. HA is a "viscosupplementation" therapy that is commonly used to treat OA. These figures do not take into account the sale of corticosteroids and pain relievers as treatments for OA (both corticosteroids and pain relievers are sold for other applications, so estimating the percentage of sales attributed to treating OA is not practical). The actual market is likely much larger. Osteoarthritis (OA) is a degenerative disease that erodes the cartilage within joints as either part of the natural aging process or due to trauma. Over 30 million Americans currently suffer from OA, and with the aging population the incidence of OA is projected to reach 25% of the adult population in the US by 2030. Over 6 million Americans are treated for post-traumatic OA, which occurs frequently in athletes that experience injury (e.g. ACL tear) on the field. Over $185 billion is spent on treating OA every year. An effective treatment for OA would have a tremendous impact on both human well-being and the economic burden of the disease. The market for treatment for OA can be approximated by examining the sales of TNA-alpha inhibitors ($30B), the class of drugs that treated OA's sister, rheumatoid arthritis (RA). The incidence of OA is 6 times higher than that of RA, implying that the global market for OA is greater than $180 billion. Currently, limited treatment options exist for OA, and those treatment options are palliative - they treat the symptoms but not the root causes of the disease. We believe an effective treatment must address OA at its source (the upregulation of proteases within joints), and target the molecular forces that destroy the cartilage and cause joint pain and inflammation. Cytonics' A2M therapy is one of the only therapies on the market that achieves that aim. Further, we believe that our synthetic A2M drug product, CYT-108, will be the only biologic therapy with the potential to completely halt the progression of osteoarthritis. The founder of the company, as well as the previous CEO are no longer full-time employees of the company. Although they sit on the board, they are not fully engaged employees and have outside interests. As a result, these individuals may not devote all of their time to the business, and may from time to time serve as employees, officers, directors and consultants of other companies. These other companies may have interests in conflict with the Company. the effectiveness of our sales and marketing efforts for our products. In the future, the Company’s products may become obsolete, which would negatively affect operations and financial condition. The medical device industry is characterized by rapid and significant change. There can be no assurance that other companies will not succeed in developing or marketing devices and products that are more effective than the Company’s treatments or that would render the Company’s products or treatments obsolete or noncompetitive. Additionally, new surgical procedures, medications, and other therapies could be developed that replace or reduce the importance of its products. Accordingly, the Company’s success will depend in part on the ability to respond quickly to medical and other changes through the development and introduction of new products. Product development involves a high degree of risk, and there can be no assurance that new product development efforts will result in any commercially successful products. The company advertised its intention to crowdfund via Twitter on May 31 2018, though there was no offering ongoing at the time. This action may have been in violation of SEC rules, as the SEC proscribes any “offers” of securities, either publicly or privately prior to the filing of the Form C. Any communication made prior to filing the Form C may be construed as an unregistered offer of securities made in violation of Section 5 of the Securities Act — a “Bad Act” that could prevent the Company from being able to use Regulation CF, Rule 506, or Regulation A in the future. The CEO is not a founder of the company and has been employed with the Company for approximately one year. Although the CEO has experience working in the healthcare industry, he has never run a biotechnology company before. Biotechnology companies are subject to unique challenges and idiosyncrasies which may be difficult to anticipate for one new to the space or market. In particular, biotechnology companies are subject to heavy regulation and scrutiny, legal liability, compliance challenges, intense technological change, among other challenges. The salescycle of the Company’s FACT and APIC products cycle is long and may be unpredictable, which can result in variability of its financial performance. Additionally, long sales cycles may negatively affect the Company’s cash flow which adversely affect its operational capacity. The Company’s results of operations may fluctuate, in part, because of the resource-intensive nature of its sales efforts and the length and variability of the sales cycle. A sales cycle is the period between initial contact with a prospective customer and any sale of its products. The sales process involves educating customers about the Company’s products, participating in extended products evaluations and configuring the products to customer-specific needs. The length of the sales cycle, from initial contact with a customer to the execution of a purchase order, is generally 6 to 24 months. During the sales cycle, the Company may not receive enough cash receipts to continue to finance its R&D efforts (the principal expense of the Company). It is difficult to predict when, or even if, the distributor’s sales force will make a sale to a potential customer or if the distributor can increase sales to existing customers. As a result, the Company may not recognize royalty revenue from sales efforts for extended periods of time, or at all. The loss or delay of one or more large transactions in a quarter could impact its results of operations for that quarter and any future quarters for which revenue from that transaction is lost or delayed. The amount of capital the Company is attempting to raise in this Offering is not enough to sustain the Company’s current business plan. In order to achieve the Company’s near and long-term goals, the Company will need to procure funds in addition to the amount raised in the Offering. There is no guarantee the Company will be able to raise such funds on acceptable terms or at all. If the Company is not able to raise sufficient capital in the future, the Company will not be able to execute its business plan, its continued operations will be in jeopardy and it may be forced to cease operations and sell or otherwise transfer all or substantially all of its remaining assets, which could cause a Purchaser to lose all or a portion of his or her investment. The Company may raise additional capital, which may cause dilution to existing stockholders, restrict the Company’s operations or require it to relinquish rights on unfavorable terms. Additionally, the company has outstanding convertible notes of approximately $800,000 which will convert in the future and may dilute investors in this round upon conversion. The Company may seek additional capital through a variety of means, including through public or private equity, debt financings or other sources, including up-front payments and milestone payments from strategic collaborations. To the extent that the Company raises additional capital through the sale of equity or convertible debt or equity securities, an investor’s ownership interest will be diluted, and the terms may include liquidation or other preferences that adversely affect shareholder rights. Such financing may result in dilution to stockholders, imposition of debt covenants, increased fixed payment obligations, or other restrictions that may affect the Company’s business. The Company’s business model is capital intensive. The amount of capital the Company is attempting to raise in this Offering is not enough to sustain the Company’s current business plan. In order to achieve the Company’s near and long-term goals, the Company will need to procure funds in addition to the amount raised in the Offering. There is no guarantee the Company will be able to raise such funds on acceptable terms or at all. If the Company are not able to raise sufficient capital in the future, it will not be able to execute its business plan, its continued operations will be in jeopardy and it may be forced to cease operations and sell or otherwise transfer all or substantially all of its remaining assets, which could cause a Purchaser to lose all or a portion of his or her investment. Success in early preclinical studies may not be indicative of results obtained in later preclinical studies and clinical trials. The Company’s products may not have been evaluated in human clinical trials, and the Company may experience unexpected or adverse results in the future. The Company will be required to demonstrate through adequate and well-controlled clinical trials that its products are safe for humans and effective for indicated uses before it can seek regulatory approvals for commercial sale. The positive results it has observed in preclinical trials may not be predictive of outcomes in future clinical trials. Its products may also fail to show the desired safety and efficacy in later stages of clinical development even if they successfully advance through initial clinical trials. The clinical trial process may fail to demonstrate that the product is safe for humans and effective for indicated uses, which may cause the Company to abandon certain products or therapies. Many companies in the biotechnology industry have suffered significant setbacks in late-stage clinical trials after achieving positive results in early-stage development and there is a high failure rate for product candidates proceeding through clinical trials. Data obtained from preclinical and clinical activities are subject to varying interpretations, which may delay, limit or prevent regulatory approval. Regulatory delays or rejections may be encountered as a result of many factors, including changes in regulatory policy during the period of product development, failure to perform in accordance with FDA good clinical practices or applicable regulatory guidelines in the EU and other countries, selection of clinical endpoints that require prolonged periods of clinical observation or analysis of the resulting data, or changes in regulatory requirements and guidance that require amending or submitting new clinical protocols. In addition, the design of a clinical trial can determine whether its results will support approval of a product, and flaws in the design of a clinical trial may not become apparent until the clinical trial is well advanced. The Company cannot be certain that it will not face these or similar setbacks. The Company conducts business in a heavily regulated industry and if it fails to comply with these laws and government regulations, it could incur penalties or be required to make significant changes to its operations or experience adverse publicity, which could have a material adverse effect on its business, financial condition, and results of operations. The biotech industry is heavily regulated and closely scrutinized by federal, state and local governments. Comprehensive statutes and regulations govern the manner in which the Company provides and bills for services and collects reimbursement from governmental programs and private payors, contractual relationships with Providers, vendors and Clients, marketing activities and other aspects of its operations. Because of the breadth of these laws and the narrowness of the statutory exceptions and safe harbors available, it is possible that some of the Company’s business activities could be subject to challenge under one or more of such laws. Achieving and sustaining compliance with these laws may prove costly. Failure to comply with these laws and other laws can result in civil and criminal penalties such as fines, damages, overpayment recoupment loss of enrollment status and exclusion from the Medicare and Medicaid programs. The risk of the Company being found in violation of these laws and regulations is increased by the fact that many of them have not been fully interpreted by the regulatory authorities or the courts, and their provisions are sometimes open to a variety of interpretations. The Company’s failure to accurately anticipate the application of these laws and regulations to the business or any other failure to comply with regulatory requirements could create liability for us and negatively affect the business. Any action against us for violation of these laws or regulations, even if we successfully defend against it, could cause us to incur significant legal expenses, divert management's attention from the operation of the business and result in adverse publicity. The Company relies heavily on their technology and intellectual property, but they may be unable to adequately or cost-effectively protect or enforce their intellectual property rights, thereby weakening their competitive position and increasing operating costs. To protect their rights in our services and technology, they rely on a combination of copyright and trademark laws, patents, trade secrets, confidentiality agreements with employees and third parties, and protective contractual provisions. They also rely on laws pertaining to trademarks and domain names to protect the value of their corporate brands and reputation. Despite their efforts to protect their proprietary rights, unauthorized parties may copy aspects of their services or technology, obtain and use information, marks, or technology that they regard as proprietary, or otherwise violate or infringe their intellectual property rights. In addition, it is possible that others could independently develop substantially equivalent intellectual property. If they do not effectively protect their intellectual property, or if others independently develop substantially equivalent intellectual property, their competitive position could be weakened. Effectively policing the unauthorized use of their services and technology is time-consuming and costly, and the steps taken by them may not prevent misappropriation of their technology or other proprietary assets. The efforts they have taken to protect our proprietary rights may not be sufficient or effective, and unauthorized parties may copy aspects of their services, use similar marks or domain names, or obtain and use information, marks, or technology that they regard as proprietary. They may have to litigate to enforce their intellectual property rights, to protect their trade secrets, or to determine the validity and scope of others’ proprietary rights, which are sometimes not clear or may change. Litigation can be time consuming and expensive, and the outcome can be difficult to predict. The Company depends on the performance of distributors and other resellers. The Company distributes its products through distributors and value-added resellers, which may also distribute products from competing manufacturers. Many resellers have narrow operating margins and have been adversely affected in the past by weak economic conditions. Such a perception could discourage resellers from investing resources in the distribution and sale of the Company’s products or lead them to limit or cease distribution of those products. The Company will not invest in any of these programs. The Company plans to receive upfront payments from the licensing agreements once they expire (in late 2020). The distributors will be responsible for the programs. The financial condition of these resellers could weaken, these resellers could stop distributing the Company’s products, or uncertainty regarding demand for the Company’s products could cause resellers to reduce their ordering and marketing of the Company’s products. The Company depends on a limited number of distributors for a substantial majority of its revenue. If the Company fails to retain or expand its relationships or its distributor reduces their commitments, its revenue could decline significantly. As a result of this concentration, the Company’s revenue could fluctuate materially and could be materially and disproportionately impacted by purchasing decisions and actions of its significant distributor. In the future, any significant distributor may alter their purchasing patterns at any time with limited notice, or may decide not to continue to purchase the Company’s solutions at all, which could cause its revenue to decline materially and materially harm its financial condition and results of operations. If the Company is not able to diversify its distributor base, it will continue to be susceptible to risks associated with concentration. The Company depends on profitable royalty-bearing licenses of its technology, and if it is unable to maintain and generate such license agreements, then it may not be able to sustain existing levels of revenue or increase revenue. The Company depends on profitable licensing of exclusive sales, marketing, and distribution rights. If the Company is unable to maintain such license agreements and to continue to develop new license arrangements, then it may not have the resources to identify new technology-based opportunities for future patents and inventions in order to maintain sustainable revenue and growth. The Company’s current or future license agreements may not provide the volume or quality of royalty revenue to sustain its business. In some cases, other technology sources may compete against us as they seek to license and commercialize technologies. These and other strategies may reduce the number of sources and potential clients to whom it can market services. The Company’s inability to maintain current relationships and sources of technology or to secure new licensees, may have a material adverse effect on our business and results of operations. The Company has conducted the following transactions with related persons. Upon expiration of the Company’s office lease in 2017, the Company began leasing space from the Company’s founder on a month-to-month basis for $2,000 monthly. Total rent expense incurred on space leased from the Company’s founder was $24,000 for year ended December 31, 2018. Rent was not being charged for use of the space in 2017. During 2018, the Company issued two (2) convertible notes, each in the principal amount of $50,000 to related parties. The Notes bear interest at a rate of 10% per year, payable quarterly, on March 31, June 30, September 30 and December 31 of each year, with a maturity date of June 30, 2021. The Company has not filed a Form D for its prior offerings of securities. The SEC rules require a Form D to be filed by companies within 15 days after the first sale of securities in the offering relying on Regulation D. Failing to register with the SEC or get an exemption may lead to fines, the right of investors to get their investments back, and even criminal charges. There is a risk that a late penalty could apply. The Crowd Notes will not be freely tradable until one year from the initial purchase date. Although the Crowd Notes may be tradable under federal securities law, state securities regulations may apply and each Purchaser should consult with his or her attorney. You should be aware of the long-term nature of this investment. There is not now and likely will not be a public market for the Crowd Notes. Because the Crowd Notes have not been registered under the 1933 Act or under the securities laws of any state or non-United States jurisdiction, the Crowd Notes have transfer restrictions under Rule 501 of Regulation CF. It is not currently contemplated that registration under the 1933 Act or other securities laws will be effected. Limitations on the transfer of the Crowd Notes may also adversely affect the price that you might be able to obtain for the Crowd Notes in a private sale. Purchasers should be aware of the long-term nature of their investment in the Company. Each Purchaser in this Offering will be required to represent that it is purchasing the Securities for its own account, for investment purposes and not with a view to resale or distribution thereof. We are selling convertible notes that will convert into shares or result in payment in limited circumstances. These notes only convert or result in payment in limited circumstances. If the Crowd Notes reach their maturity date, investors (by a decision of the Crowd Note holders holding a majority of the principal amount of the outstanding Crowd Notes) will either (a) receive payment equal to the total of their purchase price plus outstanding accrued interest, or (b) convert the Crowd Notes into shares of the Company’s most senior class of preferred stock, and if no preferred stock has been issued, then shares of Company’s common stock. If there is a merger, buyout or other corporate transaction that occurs before a qualified equity financing, investors will receive a payment of the greater of their purchase price plus outstanding interest or the amount of preferred shares they would have been able to purchase using the valuation cap. If there is a qualified equity financing (an initial public offering registered under the 1933 Act or a financing using preferred shares), the notes will convert into a yet to-be-determined class of preferred stock. If the notes convert because they have reached their maturity date, the notes will convert based on a $32,400,000 valuation cap. If the notes convert due to a qualified equity financing, the notes will convert at a discount of 20, or based on a $32,400,000 valuation cap. This means that investors would be rewarded for taking on early risk compared to later investors. Outside investors at the time of conversion, if any, might value the Company at an amount well below the $32,400,000 valuation cap, so you should not view the $32,400,000 as being an indication of the Company’s value. We have not assessed the tax implications of using the Crowd Note. The Crowd Note is a type of debt security. As such, there has been inconsistent treatment under state and federal tax law as to whether securities like the Crowd Note can be considered a debt of the Company, or the issuance of equity. Investors should consult their tax advisers. The Crowd Note contains dispute resolution provisions which limit your ability to bring class action lawsuits or seek remedy on a class basis. By purchasing a Crowd Note this Offering, you agree to be bound by the dispute resolution provisions found in Section 6 of the Crowd Note. Those provisions apply to claims regarding this Offering, the Crowd Notes and possibly the securities into which the Crowd Note are convertible. Under those provisions, disputes under the Crowd Note will be resolved in arbitration conducted in Delaware. Further, those provisions may limit your ability to bring class action lawsuits or similarly seek remedy on a class basis. You may have limited rights. The Company has not yet authorized preferred stock, and there is no way to know what voting rights those securities will have. In addition, as an investor in the Regulation CF offering you will be considered a Non-Major Investor (as defined below) under the terms of the notes offered, and therefore, you have more limited information rights. You will be bound by an investment management agreement which limits your voting rights. As a result of purchasing the notes, all Non-Major Investors (including all investors investing under Regulation CF) will be bound by an investment management agreement. This agreement will limit your voting rights and at a later time may require you to convert your future preferred shares into common shares without your consent. Non-Major Investors will be bound by this agreement, unless Non-Major Investors holding a majority of the principal amount outstanding of the Crowd Notes (or majority of the shares of the preferred equity the notes will convert into) held by Non-Major Investors vote to terminate the agreement. A majority of the Company is owned by a small number of owners. Prior to the Offering, the Company’s current owners of 20% or more of the Company’s outstanding voting securities beneficially own up to 61% of the Company’s voting securities. Subject to any fiduciary duties owed to our other owners or investors under Delaware law, these owners may be able to exercise significant influence over matters requiring owner approval, including the election of directors or managers and approval of significant Company transactions, and will have significant control over the Company’s management and policies. Some of these persons may have interests that are different from yours. For example, these owners may support proposals and actions with which you may disagree. The concentration of ownership could delay or prevent a change in control of the Company or otherwise discourage a potential acquirer from attempting to obtain control of the Company, which in turn could reduce the price potential investors are willing to pay for the Company. In addition, these owners could use their voting influence to maintain the Company’s existing management, delay or prevent changes in control of the Company, or support or reject other management and board proposals that are subject to owner approval. When you complete your investment on SeedInvest, your money will be transferred to an escrow account where an independent escrow agent will watch over your investment until it is accepted by Cytonics. Once Cytonics accepts your investment, and certain regulatory procedures are completed, your money will be transferred from the escrow account to Cytonics in exchange for your securities. At that point, you will be a proud owner in Cytonics. Separately, Cytonics has set a minimum investment amount of US $1,000. Currently there is no market or liquidity for these securities. Right now Cytonics does not plan to list these securities on a national exchange or another secondary market. At some point Cytonics may choose to do so, but until then you should plan to hold your investment for a significant period of time before a “liquidation event” occurs. A “liquidation event” is when Cytonics either lists their securities on an exchange, is acquired, or goes bankrupt. This is Cytonics's fundraising profile page, where you can find information that may be helpful for you to make an investment decision in their company. The information on this page includes the company overview, team bios, and the risks and disclosures related to this investment opportunity. If the company runs a side by side offering that includes an offering under Regulation CF, you may also find a copy of the Cytonics's Form C. The Form C includes important details about Cytonics's fundraise that you should review before investing.